Everyone claims to favour entrepreneurship, but politicians routinely propose various programs to help entrepreneurs, when they should instead concentrate on getting rid of policies that discourage them. Indeed, the empirical literature shows that interventionist policies are detrimental to entrepreneurship. The Austrian School of Economics has much to teach us about the kinds of policies that truly encourage entrepreneurship and wealth creation, and thus how to improve public policies in Canada. This Research Paper was prepared by Mathieu Bédard, Economist at the MEI, and Peter J. Boettke, Professor of Economics and Philosophy at George Mason University. • The Austrian School of Economics has a long and storied intellectual history, and can count among its adherents some of the most accomplished scholars in the field of economics, beginning with founder Carl Menger. • The Austrian theoretical account of the market process stressed a positive program of laissez-faire, one in which the role of economic policy was to eliminate legal privileges that stifle the creative powers of a free civilization. • The Scottish Enlightenment philosophers, Adam Smith prominently among them, sought to demonstrate that social institutions could emerge from human action without necessarily being the result of human design. • The prevailing attitude of the economists educated in Vienna was that of a “student of civilization,” not a “master of the universe” attitude that often captured the imagination of intellectuals at the birth of the industrial age. • Ludwig von Mises explained that a market economy based on private property was a necessary condition for economic agents to engage in “rational economic calculation” regarding alternative courses of investment and production. • During the 20th century, the newer members of the Austrian School became leading voices in a counterrevolution against the excessive aggregation and formalism of the post-WWII consensus. • As Friedrich Hayek explained, while market prices may not be perfect, the alternative of having a central figure, a conductor of some sort, try to take into account all of the tiny, dispersed bits of information that would be needed to direct the economy is simply unworkable. Chapter 2 – What Does the Austrian Theory Tell Us about Entrepreneurship and Wealth Creation? • Wealth creation and economic progress follow from individuals freely discovering and then pursuing the gains from productive specialization and the gains from peaceful social cooperation through trade. 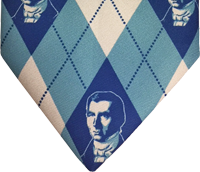 • Jean-Baptiste Say, one of the greatest thinkers in the French classical political economy tradition, was among the first to clearly define the key role of the entrepreneur, who sees opportunity and acts to coordinate production with a view to turning a profit. • However, the advancement of neoclassical economics in the late 19th century, and the near universal acceptance of the use of mathematical tools developed in the natural sciences, led gradually to the disappearance of the entrepreneur as a central character in economic theory. • For Israel Kirzner, the kind of knowledge the entrepreneur discovers is the realization of errors by market participants: prices being too high or too low, goods being overabundant in one place but undersupplied in another, innovations that are not being implemented, etc. • Entrepreneurship is omnipresent in economic arrangements, but depending on the institutional arrangements individuals are operating under, it can be either productive or unproductive. • The societies that become rich are the ones whose institutional environments push their best and brightest toward productive entrepreneurship, while societies that stagnate are those whose institutional environments make it more rewarding to engage in destructive entrepreneurial behaviour. • Without the incentives provided by private ownership, the informational signals contained in prices, and the market discipline of loss and the market reward of profit, economic systems will fail to allocate resources efficiently and to continually discover new and innovative ways of producing and delivering products to satisfy consumer wants. • Even when it comes to entrepreneurship in the conventional sense, that is, creating and operating a new for-profit business, it is difficult to measure, yet even a partial account of entrepreneurship can be useful as a general indicator of variations through time, or when comparing different institutional contexts. • Entrepreneurship is perceived positively by majorities of Canadians polled, who agree that entrepreneurship is a good career choice, and that it leads to high social status when successful. • Poll respondents in Canada see entrepreneurial opportunities around them, yet are somewhat limited by the fear of failure, and also constrained by their capabilities. • In the 2017 Doing Business ranking, Canada fares very well in a few categories, such as “Starting a Business,” “Getting Credit,” and “Protecting Minority Investors.” However, in other categories, especially “Enforcing Contracts,” Canada ranks much lower. • Within Canada, Quebec fares poorly, suggesting an institutional environment less conducive to growth than that of other provinces such as Saskatchewan, British Columbia, and Alberta, and even the Atlantic Provinces. • The portrait of entrepreneurship in Canada that emerges from surveys and statistics is a relatively good one, although with significant (if not unexpected) differences between provinces, and also with room for improvement. • A critical examination of activist policies reveals that rather than providing the tools needed to organize a vibrant and growing economy, they are often the main source of the very problems they purport to solve. • Taxes, for example, can both distort the incentives created by private property, and affect prices, which are seen by the Austrian school as surrogates for information, since they are an indirect indication of how abundant or scarce a resource really is. • Heavy taxation of individual income weakens private property because it deprives individuals of a substantial portion of their income, which in turn weakens incentives for wealth formation. • For prices to generate quality information, and ultimately for profits and losses to generate innovation, the economy must be a dynamic one in which money is free to flow, but the capital gains tax makes such movement of funds costly. • Austrian economics criticizes the effect on innovation of legal monopolies, as competition among entrepreneurs to attract customers is generally the biggest incentive to innovate. Even when sectors are not nationalized, the government crowds out private enterprise by using scarce resources like labour and capital. • The Canadian government is a large provider of subsidies, with a whopping 38% of the subsidies granted by Industry Canada from 1961 to 2013 going to just ten recipients. • Making predictions about the success or failure of particular start-ups would require government not only to know what everyone has in their minds, but also to have this knowledge long before the people involved actually have it. • Occupational licensing regulations limit the number of people who can work in certain jobs, preventing outsiders from entering those fields and making workers much more expensive than they would otherwise be. • Labour regulations that limit flexibility in terms of hiring and firing workers affect entrepreneurship by making it costlier to do business, and even sometimes completely ruling out certain business models. • In Canada, getting a drug approved and included on public insurance plan formularies of reimbursable drugs requires both federal and provincial approval, which can take years. • The standard example of entrepreneurs arbitraging between markets by moving a good from one market to another where it is worth more, which benefits consumers by bringing goods to where they are in higher demand, is effectively blocked by interprovincial barriers to trade, which cost Canadians on the order of $100 billion a year, or $2,700 per Canadian. In the Canadian political landscape, entrepreneurship is like apple pie. Every politician claims to favour it. However, there is considerable confusion about the kinds of public policies that foster entrepreneurship. Politicians routinely take advantage of this confusion to propose various programs to help entrepreneurs, when they should instead concentrate on getting rid of policies that discourage them. This Research Paper further explores this question by providing an analytical grid for thinking about policies and institutions, and why some might be better than others in terms of increasing the quantity and quality of entrepreneurship. One way to clear up the confusion and to ground policy in a sound understanding of entrepreneurship is to focus on the research being carried out by scholars in the tradition of the Austrian School of Economics. The Austrian tradition refers to a type of economic analysis that has its roots in the University of Vienna in the latter part of the 19th century, hence the name. Today, it is an approach to economic research that includes academic practitioners all around the world. One of its specificities is to think of most economic phenomena, and in fact many kinds of human interactions more generally, in terms of entrepreneurial processes. Going back to a basic understanding of what it means to act entrepreneurially, beyond the business environment, and understanding the kind of alertness to opportunities that is prior to any entrepreneurial venture, provides important insight into the topic of entrepreneurship. If entrepreneurship is something that is ubiquitous in human societies, what can government do to encourage this attitude? Can policy fundamentally make individuals more alert to opportunities? Chapter 1 of this Research Paper starts to answer these questions by going back to the origins and basic research themes of the Austrian School of Economics. 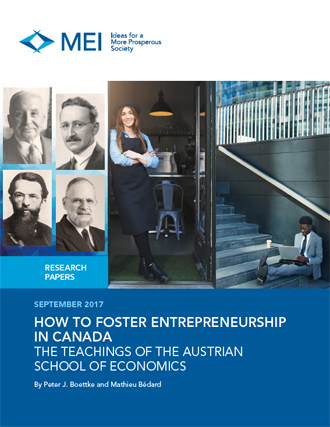 Chapter 2 is devoted to what the Austrian theory can teach us about policies that encourage entrepreneurship and wealth creation. Chapter 3 takes a look at the actual levels of entrepreneurship in Canada, and how we compare with the rest of the world. Finally, Chapter 4 applies the lessons of the Austrian economics analysis of entrepreneurship to Canadian public policies, with a view to improving those policies. 1. Mathieu Bédard, Entrepreneurship and Economic Freedom: An Analysis of Empirical Studies, Montreal Economic Institute, Research Paper, November 4, 2016.